There's a new Taboo! Well, sort of anyway. Hasbro games has re-released Taboo with new word/clue cards and a few new twists and turns that you can add into the game to spice things up a bit. To add an interesting twist to the game, Hasbro has included a special die which, if you choose to include it as part of your game, can make things more interesting. Roll the die and you might win two rounds with the timer instead of your traditional one. You might also roll the option to select only one player from your team to guess the word while you frantically holler out the clues. Or, perhaps, both teams will have the freedom to guess (with the word point going to the team who guessed correctly.) You can still play the "normal" way, of course, but this just opens up the possibilities for play when you revisit this tried and true game. Have I mentioned that I love Taboo? 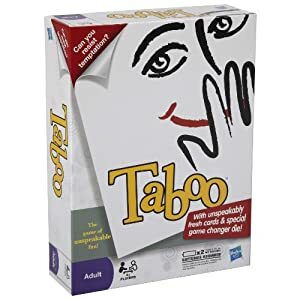 And that if you ever invite me over and suggest a team game, the best way of convincing me to play is by suggesting Taboo? I was excited when Hasbro offered me the opportunity to check out this new updated version of the game, but I'm even more excited to say that they've offered up a copy of Taboo to one of my readers here at Reading to Know! Care to win? Simply leave a comment below including a valid e-mail address so that I can contact you if you are selected as the winner. (If your name is selected, I will need a fast response from you in an e-mail in order to send Hasbro your contact information in a timely fashion.) This contest is open to U.S. residents only and will be open through Monday, February 13th. I'll select a winner on Valentine's Day! THIS CONTEST IS NOW CLOSED. THE WINNER (as selected by Random.org) IS #10 - RubynReba! Congrats! Thanks, Hasbro, for your generosity in sending me a copy and also for providing one for one of my readers here. We love Taboo! Hey, wouldn't it be fun to be able to get together and play it . . . The addition of the die sounds fun! Wow. I bet it's been 15 years or more since I played Taboo! I also loved it and would love to win. The new version sounds like fun, especially with the right crowd. Have you played Catch Phrase? Similar, but less boundaries. We own the electronic version, but prefer the old fashioned version. We also love to play apples to apples as a group, but we're always looking for new games. My email address is chhansen3(at)att(dot)net. I have always enjoyed this game, though it's been quite awhile since I've played it. We usually play Catch Phrase and Things at my in-laws' house. It has been a long time. But it would be a fun addition to our game shelf. My sister loves this game. If I won I would give it to her so we could play at our next family gathering. Fun! Please include my name! Thank you. ...AND...I saw it on Facebook! TaDah! How fun! Thanks for the giveaway! I'm not a game person but I love this game! We played all the time with Mister's family growing up, quite a few good memories. You'd think I would own one! I love this game. My guys aren't as thrilled with it, but maybe they'll indulge me, particularly with the new twists. I like the idea of both sides being able to guess. I saw the post about this on Facebook. Oh, and I saw it on fb, so maybe two entries will increase my chances even more! And I saw your lovely post on FB, so I would like another entry. Yes! Taboo is an all-time great! Thanks for the opportunity to win. We'd love to have this new version in our home. graykitty9 at msn dot com. I love Taboo! And I don't have it! I'm not sure I've ever played Taboo. I'd love to add this to our game collection. Pick me! We don't own this game and it would be nice to have when company is visiting. And I saw this on fb. Almost embarrassed to say I've never played Taboo. So it's about time I started, hope I win! Thanks for the giveaway, I'll be keeping my fingers crossed.